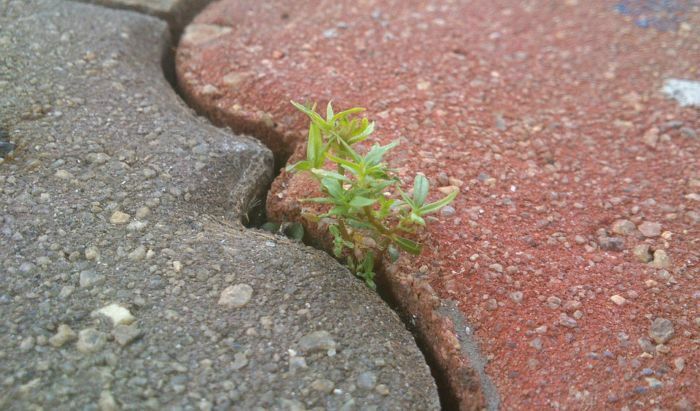 Have you ever seen a plant growing up through the sidewalk cracks and marveled at its strength and determination to thrive in any environment? We all have that energy within us and we can tap into it! The sunflower growing in the parking lot feels no shame for its surroundings of hot, crumbling asphalt while its brothers and sisters sit in a wide field on the other side of the fence. The tree bowed sideways by the heavy winds in the region doesn’t feel broken for its unusual shape. Each simply exist to fulfill their maximum potential of growth and expansion. That is their purpose and there is no judgment of the end result. To the God-Goddess, love looks like love regardless of the outer form it takes. A sunflower is still a divine sunflower whether rooted in concrete or the soft earth. A tree is no less a valued part of creation for being twisted or bent as the tall, straight cedar nearby. We can have the experience of truly thriving in our lives regardless of our circumstances or surrounding environment. We can know ourselves as successful whether we’ve built a company, traveled the world, spent a quiet life of spiritual reflection or all of the above! Truly thriving in life is an energy from within, regardless of the physical result. Ask your Soul to help you identify where you are blocking yourself from truly thriving in your life as it is right now and how to heal those blocks. In Standing in the Light®, we teach techniques for healing such blocks, but there are many techniques available. You simply need to ask! Let go of any self-doubt, shame or regret for the shape your life has taken and be grateful for everything you’ve received from all of your experiences. Focus on the beauty that you already are. Be like the sunflower and allow yourself the joy of thriving wherever you are! Love it! Be full of life and thrive. It is always our choice.